Now I’m going to share with you possibly my favorite description ever of baked goods. These cookies are girls. Yes. Girls. I had a reader tell me that in her family they use the distinction female/male to quickly tell each other if baked goods have nuts or not. I absolutely love that idea. How easy and cute is it? Can’t you just picture the family gatherings? Me: Hi mom! (hugs) How are you? Mom: Great. (more hugs) So nice to see you oh favorite daughter. Me: I love that you think you need to remind me of that all the time mom. You’re the best. Here. I brought you some cookies. Mom: Ooh they look delicious. Are they boys or girls? Me: Girls! But the biscotti are boys. HA! It’s just so easy. And, if there’s anyone in your life who has a nut allergy, you can easily tell them. Stay away from these munchies…they’re boys. It’s awesome. Ok. Maybe mildly inappropriate, but I think it’s fantastic so I’m stealing it. That’s all there is to it. The point of this story? 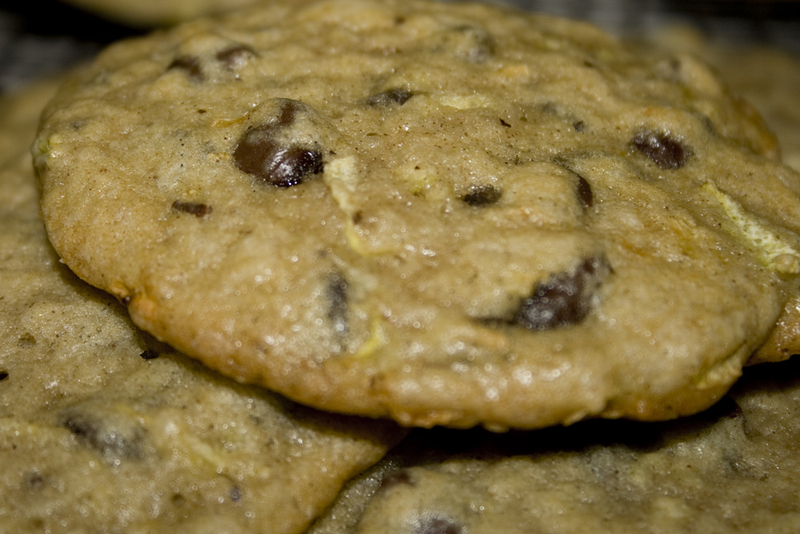 If you want to make these cookies boys, just add a cup of walnuts when you mix in the chocolate chips. But I’m telling you. Girls are better. Oh, one last thing. Because of all the moisture from the zucchini, these cookies are very soft. Almost cake like in texture. If you’re looking for a crispy cookie – this is not it. Also, if you want to up the chocolate factor, you could easily make double chocolate zucchini cookies by replacing 1/4 cup of the flour with cocoa powder. Yum. Add the egg and vanilla to the butter mixture until incorporated. Gradually add the flour mixture to the butter mixture until just blended. Bake for 15 to 20 minutes, or until golden. Do not overbake, they will look slightly underdone when removed. If the sides are set and the edges are golden, they’re done! I actually laughed out loud at the explanation for boy vs girl baked goods – hilarious! I also love the zucchini-chocolate combo; its probably one of my favourites. I usually put the combo in bread with walnuts (boy bread!) but I think I’ll have to try these next time. That’s why I had to share it. When my reader posted that I dissolved into giggles. I’m usually a zucchini bread person too. These were a nice change of pace. Enjoy! I’ve made zucchini muffins and zucchini cake, but never zucchini cookies. Thanks for the recipe. Same here. First time using zucchini other than in cakes/muffins. Enjoy! Once again you have a recipe that I am looking forward to trying. I think we have very similar palates. Thank you so much for the idea! I love it! 🙂 Enjoy the cookies! I can’t quite imagine the flavour so guess I will just have to make a batch to find out. Pretty much they taste just like chocolate chip cookies…with a hint of cinnamon. Try them out. They are a little different than the norm and very tasty. and bring her daughters to America. I am going to try adding the cocoa powder. Can I freeze these lovely cookies?